ARE YOU LOOKING FOR VINYL FENCING? Amateur handymen who believe installing a fence is a quick and easy task are in for a surprise. Fences are an extremely important feature of any property. They are not only responsible for demarcating the boundaries of your property, but also in disabling strangers from trespassing and squatting on it. Building a strong and reliable fence will ensure that you do not have to frequently spend time and money on its maintenance or repair. A Fence Utah is an expert fence installation outfit operating out of Utah with a number of years of experience within the property maintenance industry. If you are looking for professionals to construct a vinyl fence for you, your search is over. You have decided that vinyl will be the material that you would like your fence made out of. Vinyl fences are a great choice for any property owner because they are extremely easy to maintain, relative to wood-based fences. Vinyl fences are also aesthetically appealing, and can add an element of charm to any property. But how do you go about choosing what kind of fence you would like to construct? Let A Fence Utah help you make that decision. A Fence Utah offers a large selection of fence and railing styles. We will help you choose the kind of fence style that is aligned closest to the vision that you have of your property. Depending on the kind of aesthetic that you are looking for, we can narrow our options down and help you make a decision. At A Fence Utah, we also offer a range of rail fences as alternatives to picket, privacy, and semi-privacy fencing. 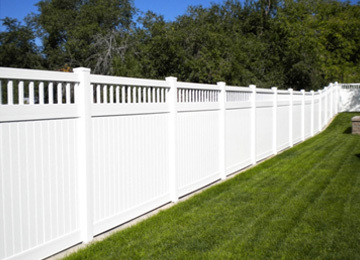 The team at A Fence Utah is not content with just providing high-quality products at the most affordable rates. We are looking to build fulfilling relationships with all our customers, premised on integrity and professionalism. If you are looking for a new installation, do not waste any more time in getting in touch with us!